What factors can affect blood pressure? High blood pressure is fast becoming a leading cause of death worldwide and it is estimated that it is responsible for over ten million deaths each year (1). High blood pressure is classed as a lifestyle disease which means that particular lifestyle choices are linked to its development. Making alterations to certain lifestyle factors can drastically improve blood pressure. 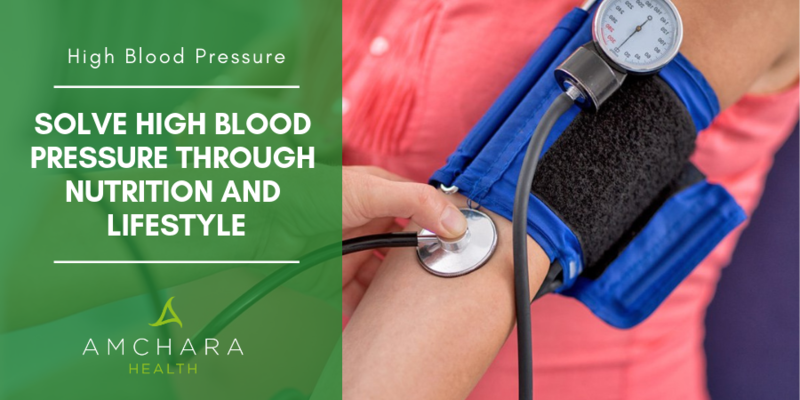 In this article, we discuss how specific nutritional alterations and lifestyle changes can benefit blood pressure. Blood pressure describes the pressure circulating blood puts on blood vessel walls. Blood pressure will vary according to age, health status and fitness level. In general, a healthy blood pressure for adults should be around 120/80 mmHg. It is worth noting that several measurements should be taken, and an average recorded. 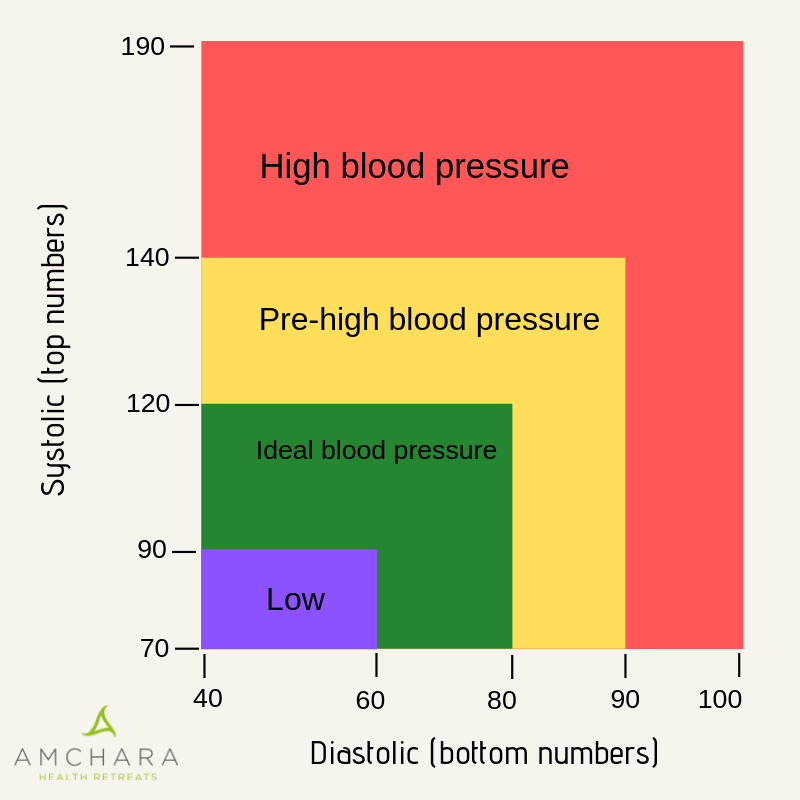 If only one of the numbers is higher, or lower, than average then it may still indicate high or low blood pressure. High blood pressure is classed as several readings above 140/90mmHg. It is common for it to go undetected for some time and symptoms may only be seen if blood pressure becomes very high. This is why it is often called ‘the silent killer’. There are many factors that can affect a blood pressure reading. Increased activity levels such as when you are moving around, walking or exercising cause the body to need more oxygen. The way the body reacts to this need is to increase heart rate and blood pressure. Once activity levels reduce then blood pressure should return to its previous value. This is why blood pressure should be taken when in a resting state. Anxiety and stress can increase certain hormones that can have an impact on the heart and blood vessel walls (2). This is a normal response and part of the “fight or flight” response once needed to react to predators. Unfortunately, modern society is now very overstimulating and often these stress hormones can be triggered at inappropriate times, leading to high blood pressure. The term “white coat syndrome” reflects the stress seen upon visiting a doctor - many people experiencing this can have high blood pressure readings whilst in the GP surgery but not in other environments. Having a higher than average body weight can increase blood pressure as the heart has to work harder to circulate the blood - too much weight also triggers other changes that influence blood pressure (3). Fatty deposits within arteries (atherosclerosis) can narrow arteries making it harder for blood to flow effectively (4). Lifestyle factors such as lack of physical activity, smoking (5,6) and alcohol consumption (7) can all contribute to high blood pressure and the risk of further cardiovascular issues. The type of food eaten also has a large role to play and there is much debate over whether a high intake of saturated fats in red meat may lead to narrowing of the arteries which impacts blood pressure, or whether it is due to other compounds damaging blood vessels (8). Trans fats, produced during food manufacturing, are well known to cause damage to blood vessels (9). They can be found in foods such as margarines, deep-fried fast foods, bakery products, packaged snack foods and crackers. A high intake of salt in the diet is a known risk factor for the development of high blood pressure. Salt can be hidden in many foods and can be surprisingly high in packaged foods, ready meals, sauces, pickles and tinned soups. Although a high sugar diet is often thought to be mostly linked to the development of conditions like Type 2 diabetes, it is also linked to high blood pressure. A high sugar intake is responsible for many changes including damage to blood vessel walls leading to them becoming narrower, thereby increasing blood pressure (10). Caffeine from drinking tea and coffee has long been thought to negatively impact blood pressure, but research shows this may be down to each individual person. It was found that people who did not usually drink tea or coffee were more affected than those who were regular tea or coffee drinkers. Caffeine may not be the main culprit when it comes to high blood pressure though, as even decaffeinated coffee can increase blood pressure in those not used to drinking coffee (11). Modifying certain lifestyle factors and making long term alterations can have a profound effect on your health. Potassium is a mineral that has many functions within the body, including controlling blood pressure. If you have too much sodium (for example from salt in foods) or low potassium, you will be more likely to experience an increase in blood pressure. Potassium is found in fruits and vegetables, so it is important to increase the amount of fruits and vegetables you eat. Aim for 8-10 portions of fruit and vegetables a day, with an emphasis on vegetables. Eat a wide variety and colours of fruits and vegetables as they contribute many more nutrients that support cardiovascular health, not just potassium. Particularly useful fruits include dark berries such as cranberries, blackberries and blueberries (12), as well as strawberries (13), pomegranates (14), grapefruit and other citrus fruits (15). Be aware that grapefruit can interact with some prescription medicines and you may wish to discuss this with your doctor first. Blood pressure supportive vegetables include beetroot (16), celery, sweet potato, squash, garlic and onions (17). Magnesium is known to be a muscle relaxant and may aid in relaxing blood vessel walls. It has been shown to be supportive of healthy blood pressure (18). Magnesium deficiency is increasingly common which may have many detrimental effects on many aspects of health. Foods rich in magnesium include dark green leafy vegetables like spinach, Swiss chard and kale. Almonds, cashews, pumpkin seeds, avocado, raw cacao nibs or powder, brown rice and beans are also good sources. The omega-3 essential fats are not made in the body and so a good dietary intake is required. Omega-3s are pre-cursors to anti-inflammatory molecules in the body, aid in keeping blood flowing effectively and also help to protect cardiovascular functioning (19). Omega-3 fats can be found in oily fish such as mackerel, herring, salmon, trout and pilchards as well as walnuts and chia and flaxseeds. Aim to eat oily fish 2-3 times a week and add seeds to soups, salads and cereals daily. Omega-9 is a monounsaturated fatty acid (MUFA) and is found in olives and olive oil. It has been shown that olive oil has a protective effect on the cardiovascular system and a good dietary intake can reduce blood pressure (20,21). This may be one of the reasons why a Mediterranean style diet, rich in olive oil, is of benefit for blood pressure (22). Herbs and spices add much flavour to food - not only do they increase enjoyment of food and provide potent protective antioxidants, they also have a beneficial effect on the cardiovascular system. Adding spices like cardamom (23), cinnamon (24), ginger (25), turmeric (26) and the herbs marjoram (27), sweet basil (28), rosemary and oregano to your food can have beneficial effects on blood pressure. Caffeine is found in drinks like tea and coffee but can also be present in sports drinks, energy drinks, chocolate (especially dark chocolate) and coffee flavoured ice cream and desserts. Caffeine is known to stimulate adrenal hormones which can raise blood pressure. As the effect of caffeine varies for each person it is wise to monitor intake and to also drink some caffeine free drinks like chicory root or barley root ‘coffee’ alternatives. There are several ways that alcohol impacts blood pressure and long term alcohol intake can cause lasting effects on blood pressure. Some foods are linked to the development of cardiovascular disease and have been implicated in changes that can exacerbate or lead to high blood pressure. Salt intake should be kept to below 6 grams a day and be aware of all the hidden salts in processed, packaged and takeaway foods. As there is no definitive answer when it comes to saturated fat intake, it is wise to replace saturated fats found in red meat, dairy products and fried and fast foods, with mono and polyunsaturated fats found in oily fish, olive oil, nuts, seeds and avocado. Stay away from anything that contains trans fats as there is a strong link between these and cardiovascular disease (30). In order to control blood sugar, prevent high insulin levels and reduce damage to blood vessels, it is important to keep sugar intake low. Avoid adding sugars to food and drink, even natural alternatives like honey, maple syrup and coconut palm sugar, and watch out for hidden sugar in packaged foods. Replace refined or white goods with brown or wholemeal alternatives which are slower to break down into simple sugars and do not give a surge in insulin release as refined foods do. They are also higher in fibre and nutrients that help with keeping you fuller for longer, therefore assisting with weight loss. Good whole grains include oats, rye, quinoa and brown rice. It may be useful to take specific nutritional supplements to aid in blood pressure reduction and management. It is best to seek guidance from a qualified practitioner on which ones are best in your individual circumstances and be aware that some nutrients and herbs may interact with medications. Supplement regimes should be assessed every 6-12 weeks as circumstances may change. Losing weight has shown to give a significant reduction in blood pressure in those who are overweight, and this beneficial effect can be maintained long term (38). Reduction in body weight can drastically reduce the risk of stroke and other cardiovascular issues. It can be hard to know where to start with weight loss and changes should be made that are manageable, sustainable and long term. It can be helpful to use apps or digital devices which allow you to track your nutritional and calorie intake and also physical activity - therefore energy expenditure. There are many apps available and they can provide an analysis, suggestions and some even encourage forums to meet other people in the same situation. This can help with support and motivation through your weight loss journey. Aim for 30 minutes of exercise 2-3 times a week. You should ideally be out of breath and a little sweaty. Start slowly and don’t over exert until fitness levels have increased, especially if your blood pressure is very high. You may wish to consult your doctor before embarking upon a new fitness regime. Fast walking, jogging, cycling and swimming are good for raising your heart rate. It is also important to stay active during the day and long periods of being sedentary, such as sitting down for several hours, also increase the risk of lifestyle diseases. If you work at a desk make a point of getting up regularly and go for a short walk or stretch, go and visit a colleague in the office or offer to take the post to the post box. Walk to work, get off the bus early, take the stairs instead of the lift and carry your shopping bags to the car rather than push them in your shopping trolley. Housework and gardening both count towards activity levels too. Try relaxation methods such as yoga, Pilates, tai chi, meditation and deep breathing exercises. Long soaks in the bath also help to relieve tension – the essential oils lavender, geranium and chamomile can be added to aid relaxation. Try to prioritise your day in order to reduce stress and remember that if you don't complete something there will always be another day. Each person experiences stress in their own way and finding the right stress relief method may take a while before you find one that works for you. One way to track your stress response is through something called heart rate variability (HRV). The interval between heart beats can vary, and it seems that under stress there is less variability - when we are relaxed, and stress is under control, the heart rhythm has more variability. A low heart rate variability has been linked to an increase in risk of cardiovascular disease (39). Devices that track heart rate and rhythm are available and are much like fitness trackers, in fact, some fitness trackers have built in monitors to track HRV. Apps can be used to analyse the variability and give you a number – the higher the number the more variability there is i.e. better stress response. This is the time when the body and mind rests, repairs and regenerates. It is also a time when the body is stimulated to cleanse cells, removing damaging waste products. A lack of sleep is known to stimulate a cascade of hormones that disrupt appetite making you hungrier (40), leading to an increase in body weight (40) and negatively impacting the stress response (41). Disruptions to sleep quality and quantity can increase blood pressure (42). Getting a good night's sleep can be difficult and several changes may need to be made. Keeping the bedroom dark and cool and eliminating all digital devices can help. Some people find that a sleep routine is useful and getting up at the same time each day helps to set the body clock. One other important factor for setting the body clock is to get good exposure to daylight during the day, especially in the morning. This resets the body clock and can help with sleep duration and quality. Avoiding smartphones, laptops, computers and TVs during the two hours before bed prevents light stimulation at the wrong time of day. Smoking is linked to a myriad of health concerns and quitting smoking reduces the risk of these. When trying to quit there are many methods and some people opt for going cold turkey. Whichever method you choose, be prepared and aim to keep yourself busy. You are more likely to succeed if you have plenty of things to keep your mind occupied. Activities to keep you busy can include increasing exercise, doing arts and crafts, stress reduction techniques or simply going for a walk - positive activities lead to a positive result. You may also wish to avoid the places where you find your smoking increases - such as when out with friends or at the pub. Let your friends and family know your goals and ask for their help. If you are tempted to swap cigarettes for vaping, you may be interested to hear that e-cigarettes may also be involved in changes that lead to an increased risk of cardiovascular issues (43). Tackling the issue of high blood pressure does not always mean resorting to medication - with guidance from an experienced practitioner, more natural methods can be used to work towards a healthy blood pressure. As there are many factors that may need altering, practitioner support can be useful to identify the factors relevant to your situation and get personalised advice on where to start. We would like to encourage you to share your experiences in order to support and empower others in the same situation to make positive changes. If you have experienced high blood pressure tell us your story, what did you find helped? How hard did you find the journey? Did you learn anything new in this article?